Posted on 01/12/2019 , updated on 01/18/2019 by KWLS Admin. 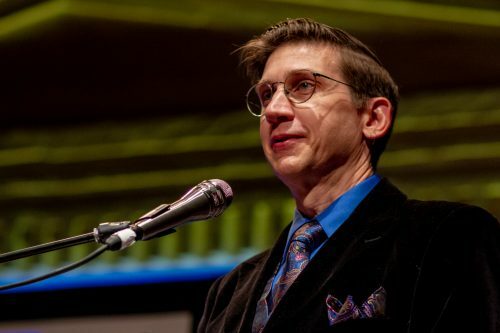 Eric Shanower enlightened and entertained participants of the Key West Literary Seminar with his obsessively accurate depiction of the Trojan War in the graphic novel Age of Bronze. “Even though you are familiar,” he warned, “you will find surprises. I hope you like surprises.” Surprises were indeed found, as Key West-born Shanower described the journey to bring a factual, comprehensive account of the Trojan War to comic book readers. Shanower began by noting his intent: to keep Age of Bronze set in the correct time and period. Mentioning there would be “no classical drag or a mish mask-like motion picture starring Brad Pitt… AJAX, computer viruses, or condoms,” he described his research process. When he began this project in 1990, he believed the research would take five years: that was his first surprise. Shanower meticulously scrutinized countless works, beginning with The Iliad and The Odyssey and moving to the Aeneid of Virgil, The Metamorphoses, and Troilus and Cressida, among others. Coupling graphics with his dialogue, he showed the audience the variety of primary sources he examined to create accurate illustrations, including the mask of Agamemnon, pictures, frescos, stone reliefs, and on-site research experiences. After consulting primary sources, Shanower makes lists of scenes, characters, and props. After the scripts are done, he makes a thumbnail sketch, followed by the finished framework. True to his self-described conviction to “do it right,” he draws the final artwork in pencil, uses a pen to draw panel borders in ink, and adds his own lettering and balloons. Pen is used to go over the pencil lines, and the pencil markings are erased. He then scans, clean ups, and sends the pages to the colorists and then the publisher; followed by the cover, dust jacket, title page, maps, pronunciation guides, and genealogy. “And that’s plenty for now, so I will stop talking,” he jokingly said as he finished. What I, as a local teacher, found the most inspiring about Shanower was his unwavering dedication and undying perseverance to paint a hauntingly accurate picture of the Trojan War, coupled with the portrayal of timeless characters. When asked what his obsession was with the right details, Shanower responded “I want to do it right! The research is fun. I get to read stories.” He reminded me of the importance of authenticity, a lesson I will bring back to my students. Roxann Fournier is a budding writer and current teacher in Key West, Florida.